A Republican congressman says that Army investigators have misinformed service leaders about a renewed probe into the 2010 death of a suspected Taliban bomb maker in Afghanistan as part of their "retaliatory pursuit" of a former Special Forces officer. 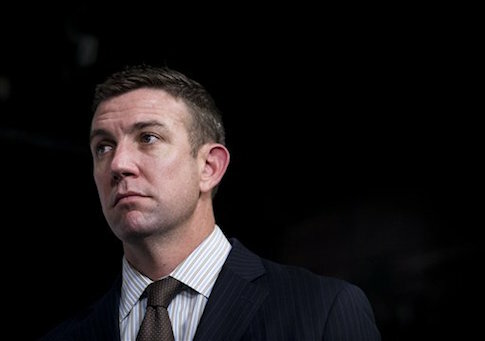 Rep. Duncan Hunter (R., Calif.), a former Marine, wrote a pair of letters on Monday to Army Secretary Eric Fanning and Mark Milley, the Army's chief of staff, objecting to the Army Criminal Investigation Command's decision to reopen its investigation into former Maj. Mathew Golsteyn, whom the Army accused of violating the law of armed conflict for reportedly killing an Afghan bomb maker while deployed to Afghanistan. A three-member panel of officers at Fort Bragg decided in June 2015 that the allegation against Golsteyn was unsubstantiated, but Army investigators recently reopened the probe after Golsteyn acknowledged killing the Taliban bomb maker during an interview with Fox News anchor Bret Baier. Golsteyn and his team had linked the bomb maker and his equipment to the deaths of at least two Marines. Hunter on Monday accused the Army Criminal Investigation Command, or CID, of "misinforming" service leaders about the investigation, citing Golsteyn's testimony from a 2015 Board of Inquiry hearing that he targeted the suspected bomb maker outside the rules of engagement. "I am concerned that you have been misinformed by Army Criminal Investigation Command," Hunter wrote to the service leaders on Monday. "Golsteyn's Board of Inquiry examined in depth the allegation that he targeted an Afghan bomb maker outside the rules of engagement." "The law of land warfare expert for NATO testified at the board that, given the Central Intelligence Agency transcript and all the available evidence, the engagement was lawful and supported by the laws of armed conflict," he wrote. "He further testified that the individual was not a detainee, but a member of a hostile force and demonstrated hostile intent that posed an immediate threat to Golsteyn's forces and the civilian population." "This is important—and a point that deserves consideration as you examine whether to permit CID to continue its reckless and retaliatory pursuit," Hunter wrote. Golsteyn, who led a team of Special Forces troops in Afghanistan, allegedly admitted during a 2011 job interview with the CIA that he killed the Afghan insurgent during a February 2010 operation in Marja, which precipitated the Army's initial investigation. In a separate letter Monday, the Republican lawmaker expressed "deep concerns regarding the overreach of the Army Criminal Investigation Command," pointing to several separate reports of agents engaged in unprofessional behavior. For instance, Army investigators went through the trash of Maj. William Swenson—a soldier who was awarded the Medal of Honor for heroism in Afghanistan—while surveilling him because he was mentioned in an Amazon.com book review written by Golsteyn, the Daily Beast reported in February 2015. Hunter said that his office received "several reports" over the weekend of CID agents acting unprofessionally during the investigation. "In one instance, going to the wrong resident. In other instances, leaving a torn note on a vehicle and even contacting the wrong household, which prompted a neighborhood-wide discussion," Hunter wrote. "I am once again interested in CID's record of actions and demonstrated overreach." The lawmaker further said that several agents at the Fort Bragg Army installation in North Carolina were accused of "kidnapping a civilian and taking him to a remote area on the base" when the Golsteyn probe began. "Sources at the time indicated that the civilian was allegedly involved with the wife of one of the agents. I'd like to know the full outcome of this matter and specifically who on the Army's part oversaw the investigation of the agents," Hunter wrote. "I would also like to know how many complaints and reports of misconduct have been made since 2010 against the Fort Bragg CID office." The Washington Post first reported last Thursday that CID had reopened the probe into Golsteyn after his interview on Fox News' Special Report. Hunter, who has been an advocate for Golsteyn, immediately criticized the renewed probe, communicating his embarrassment to service leaders and accusing investigators of unfairly targeting the former Green Beret. Swenson, the Medal of Honor recipient, was one of several service members who testified on Golsteyn's behalf at the 2015 Board of Inquiry hearing. The two met during training at the start of their careers as infantry officers. "Having known Golsteyn through the course of his career as an Officer, I can truly say he is the finest Officer I have served with,"Swenson wrote in a letter to Hunter last year. "He stands apart. 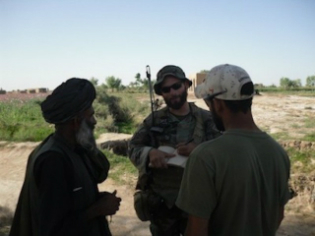 When our nation calls for warriors to defeat our enemies, it calls for officers like Matt Golsteyn. I would gladly stand with him on any battlefield against the enemy." While the administrative panel did not substantiate that Golsteyn violated the law of armed conflict, the panel faulted him for conduct unbecoming of an officer and recommended he face general discharge under honorable conditions. Golsteyn had his Special Forces tab and Silver Star, which he received for his service in Afghanistan, revoked by the secretary of the Army before the board made its decision. This entry was posted in National Security and tagged Army, Duncan Hunter. Bookmark the permalink.